Heating and cooling your home makes up nearly half of your energy bill, says the U.S. Department of Energy. Right now, you might be enjoying low utility bills, especially if you live in a climate with perfect spring weather. But the “I can’t believe it’s this hot!” summer days are coming. Soon, you’ll run the air conditioning around the clock just to stay comfortable. That could cost you a lot of money if your system isn’t ready. These simple steps can prepare your AC for the warmer summer months. This is probably the easiest air-conditioning maintenance you can do, but many people don’t do it often enough. The filters should be replaced once a month to keep your AC running smoothly. For central air systems, the filter is usually located behind a metal panel on the face of the blower unit. Unscrew the metal panel, remove the old filter and install the new one. For window units, the filter is located on the face of the unit behind a metal or plastic panel. Many window units come with a permanent filter. If you have one, take the filter out and gently clean it with a combination of white vinegar and water. Allow the filter to air dry before you put it back in. You can order new filters through Amazon, or check out companies that specialize in these products, such as Discount Filter. The pipe that carries condensation away from your air conditioner can get clogged. If the pipe becomes clogged, it could back up into the air conditioner — or into your house — and you’ll have a messy problem and a big repair bill. To combat this, locate where the pipe drains out and make sure it’s draining properly. If not, use an algaecide to clean the pipe. Algaecide is primarily used to remove algae. You can find it at pool supply stores. 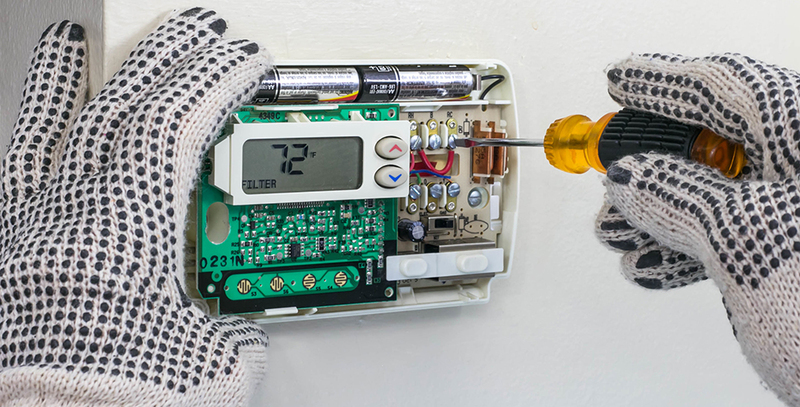 If you don’t already have one, you can gain significant energy savings by installing a programmable thermostat and setting it to reduce the use of air conditioning or heat at times when you don’t need it, like when you’re away for work. Fortunately, they’re pretty easy to install yourself and require only a couple of tools. During the winter, your AC’s outside unit has been collecting dust, mud and other debris, especially if you don’t use a cover. All of that gunk clogs up the unit, causing your AC to run sluggishly. For lightly soiled units, disconnect the power and spray down the outside of the unit with a garden hose. For heavily soiled units, buy a commercial air-conditioner cleaner from a hardware store. After your outside unit is clean, use a level to make sure the concrete slab is level. If it’s not, the unit will have to work harder to keep your house cool. If the slab isn’t level, pry it up with a board and add gravel underneath in small amounts until it is. Remove the board when you’re done. Plants, leaves, high grass and debris located close to your outside unit can reduce your AC’s performance. Before you start running your AC, cut the grass, clean out any debris and consider removing plants that block the unit. During the summer, check the unit for debris at least once a month. Look for disconnected joints, separated pieces and small holes in your ductwork. If you find leaks, seal them with tape carrying an Underwriters Laboratories logo. Fabric and rubber-backed tapes break down quicker. Some AC units have an accessible evaporator located above the furnace. To tell the difference, look above the furnace for either a plenum wrapped in foil or one covered by a metal box. If you see a metal box, your evaporator isn’t accessible. If you see foil, your evaporator is accessible and you can clean it. To do so, gently remove the foil-covered insulation. Underneath you’ll see several small screws holding a plate in place. Remove the screws and the plate. What’s left is your evaporator. Clean the front and back of the evaporator with a wire brush. Screw the plate back into place, and reinstall the plenum. For more tips and information, check the U.S. Department of Energy site on maintaining your air conditioner.